At the Chicago Youth Boxing Club, Gabriel Navarro, the head coach, says sports are a great way to motivate youth to stay on the right path, away from a life of crime. Photo by William Camargo. In July, Gabriel Navarro stood inside the ring at the Chicago Youth Boxing Club, absorbing the punches thrown by one of his students. The two sparred, following each other around the ring and fighting to gain the upper hand. Fifteen years ago, Navarro was the one throwing the punches, taking official boxing lessons for the first time at the age of 18. Looking back now, Navarro says boxing was one of the sports that kept him away from the streets—and away from trouble. He hopes that, by putting on the gloves, his students will take the same route he did. On Wednesday nights, the gym even hosts sessions for members of the Latin Kings, keeping them from gangbanging during key nighttime hours. 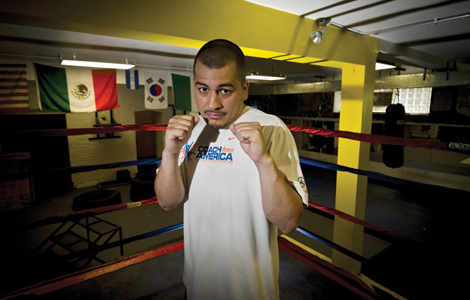 The gym, in the basement of La Villita Community Church in Little Village, serves two purposes: teaching youth how to box while keeping them away from the violence that fills the streets outside. It’s a refuge that provides a healthy, constructive alternative to gangs and guns, allowing them to focus on themselves and vent their frustrations. About 75 active members, ages 8 and up, attend the gym, which, besides boxing lessons, offers academic tutoring in subjects such as reading, math and science. Navarro, 33, is both the gym’s head coach and a mentor for his students, who come from all across the city—and even Cicero. Born and raised in Little Village, Navarro, like his students, has had firsthand experience with gangs, violence and drugs. Though he was never in a gang himself, Navarro says many of his friends have fallen victim to violence and drug addiction. One friend, a man who died after police used a Taser on him while he was high on cocaine, is memorialized in a tattoo on his right leg. But sports have always been his escape from the violence. An avid athlete since he was young, Navarro says his father always motivated him to stay involved in sports ranging from baseball to wrestling. “I probably wouldn’t be alive right now if it wasn’t for sports,” he said. Now Navarro uses the lessons he learned from sports and the streets to keep his students in the ring and move them forward. The Chicago Reporter sat down with Navarro to discuss his work. When you grew up in Little Village, what kind of violence did you experience? Half of the people I used to hang around with were gangbangers. Because there was nothing to do but gangbang. We didn’t have a park. The high schools, after they let out their kids, they closed down the schools—they don’t let nobody play basketball after school or stuff like that. My friend was a drug addict. He grew up being a gangbanger. He said he shot at people. He probably killed a couple of people. So when he was high, he used to see the people that he shot at, he’ll tell me. He’ll be like, ‘Man, all my demons, when I’m high, all my demons come out.’ He scared the crap out of me growing up, the way he used to act. Like not violent towards nobody, but I’m not going to do a drug and be scared of everybody. You know, what’s so fun about that? How did you stay away from all that? I was playing baseball. I lived on the opposite side of the gang line, so my coach said, ‘It’s either gangbanging or baseball. You know, if you start gangbanging, you’re not going to be able to come to the park no more because the gangbangers are going to pick on you.’ So I’m like, ‘You’re right.’ So I picked baseball over gangbanging, and I never had any problem with no gangs. My dad used to always keep me busy when I was young. He always gave me money. One thing he said: He’d rather be broke and have me have money than me go out and rob or steal. That was his biggest fear—for us to go to jail for stealing money or something. So he always kept me busy in sports and always gave us money. As long as we had some type of money in our pockets, we won’t be thinking about stealing, so my dad was always like that. He put me in baseball. He introduced me to baseball, and that’s all I needed. After that, I did football, softball—almost every sport I loved. How does your organization get youth away from violence? By us mentoring them. Kids just want to be heard. The parents are real busy, and they don’t got time for their kids ’cause they’re trying to support them. That’s all they know—how to work, make money to support their kids—but they don’t really listen to them. They work all day and they don’t got time for their kids. So I’m here. I listen to them. We got Fernando, who’s another assistant coach. We got Hassan. We all just listen to the kids. They tell us some pretty private stuff. Their parents are not listening to them, so they don’t have nowhere to go to. So we talk to them. I give them advice. They listen. I guess they just want to be heard; they just want to vent and have somebody listen. I try to tell them like life experiences that I had. I kind of scare them, like not scare them, but I’m just telling my story, and they’re like, ‘Oh my God, I don’t want to be like that.’ I saw everything in this neighborhood, from gang beatings to shootings to being shot at. I hung around with gangbangers. I never joined any type of gang, but it’s hard not to have a friend that’s not in a gang in this neighborhood, back then when I was a teenager. Now, hopefully, it’s changing, but when I was a teenager, it was so hard not to meet that one person because you meet ’em at school. I try as hard as I can to try to get them out of gangs. You know, by just telling them personal stuff about me that opens up their eyes, I guess. Why do you think sports are the key to reducing the violence? It’s fun. Once you get them involved in sports and get them into it, they just love it. They’re not used to it. They just know to hang around the street, be out all day. If you’re out all day, you might either go the good path or the bad path. And most of them choose the gangbanging. But since sports are hitting Little Village real hard now, I think it’s helping a lot. We actually have Wednesday nights, from 8:30 to 10:30, we have a program where we open up the gym to all the gangbangers. And so on Wednesday nights, I have a bunch of gangbangers that instead of being in the street, they’re right here, hitting the bag, or I’m doing pads, or they’re lifting weights, they’re playing basketball upstairs on the third floor. I used to always get into street fights for some reason, and then I joined boxing and I stopped, like I never got into a fight again in the street. I kind of felt like I’m training to fight—why would I want to go and fight a guy that is not trained to fight? So it kind of makes you think, ‘Oh, I won’t fight. For what?’ I guess they stay with that mentality that they’re trained to fight just in the ring, not in the street, because a trained fighter could really hurt somebody—just a regular, random kid. We actually teach our kids to be trainers because not everybody is going to make it as a boxer. So we teach them how to also be trainers. Sometimes, there’s 40 kids and three coaches. So we teach our kids who’ve been here the longest—we teach them how to be responsible and help us out. You know, not to be selfish. ’Cause a lot of kids are very selfish. You know, we’re helping you, we’re taking you to every fight, so now you help us, too. It works both ways. We help you, you help us. But the way they’re helping us is in a good way, like you help us by going to the job interview. You know, you help us by going to this college. We go to Notre Dame University and we take college tours over there. So by them helping us, they’re actually helping themselves.